The problem with horror is the body count. In general, when characters start dropping like flies, it becomes difficult stay invested. Why care when everyone is going to be slaughtered, right? Horror comic books have an extra hurdle since the word count is low. There just aren’t a lot of pages for the characterization a reader needs in order to get the sock-it-in-the-gut punch each death should represent. 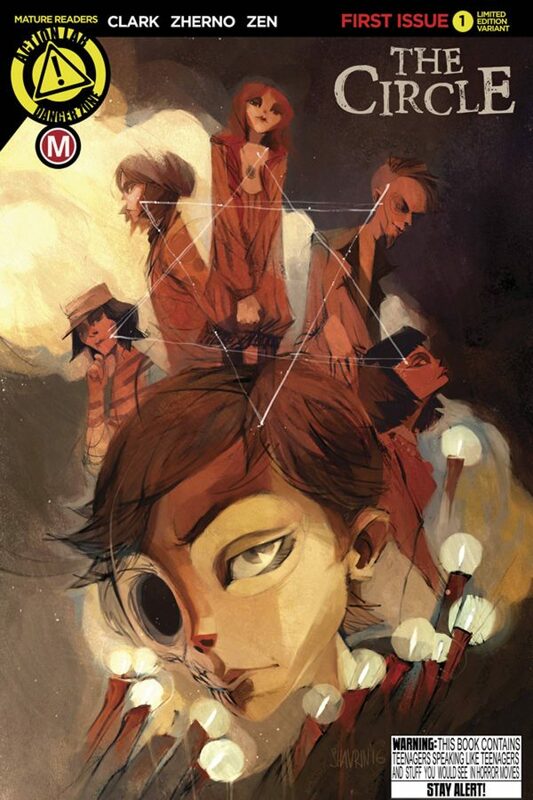 But Action Lab Entertainment’s The Circle by Damon Clark (writer) and Alyza Zherno (artist) manages to clear that obstacle in a unique way. The Circle tells the story of Christian, also known as the new kid in town, who is bullied at school and turns to the weirdo clique to find solace. Like you do. I mean, this is literally how I survived high school. If it hadn’t been for the weirdos, freaks, and geeks I would’ve had no friend, especially in a small town. You’re the one person with spiky pink hair, piercings, and tattoos at the lunch table? Move over—you’re probably one of my people, and I’m sitting next to you. The girl who does the dandruff art in Breakfast Club? My favorite character. The truth is that I feel safe when there are odd people around. I guess that’s why what happens in The Circle is so horrible. Turns out the weirdos aren’t the comfort Christian needs. Sure, they adopt him and show him to their spooky-cool club house in an abandoned sewer tunnel. Probably Christian should have been more suspicious when their hideaway’s library only had one book. The lesson here? Never trust people without books. Moreover, if the only book they have is covered in runes and filled with creepy spells: run. Alas, the should-have-been-safe weirdo clique convinces Christian that he’s needed. Of course, they mean that a sixth completes the spell, but even so, who doesn’t want to be the chosen one? Yeah, I’d fall for it. (Don’t lie; you would, too.) Of course, at that point, things go from bad to worse for poor Christian. Pretty soon the body count is rising. Zherno’s illustrations and coloring elevate The Circle to something that will haunt you. Her artwork is genuinely creepy. And that’s part of what I’m looking for in any horror story: atmosphere. Zherno creates that with spooky, elongated, crawling, and spidery lines that have a quality to them that makes you want to both linger and flinch away at the same time. I was not at all surprised to find Zherno’s Twitter feed full of terrifying photos of clowns and the kind of curios arty horror fans thrive one. She clearly takes her composition cues from the sort of death mask daguerreotypes that feature heavily in News of the Weird. Don’t get me wrong—the story is compelling and engaging, too. (I was particularly impressed with Christian’s dad as a character). But, of the creative duo behind The Circle, Zherno is the one I’ll be watching the closest. The Stone Man Mysteries Have Gargoyles, Scots, and Demons, Oh My!